The “What If?” campaign for Toyota’s current best-selling vehicle in the U.S. features three of the 2019 RAV4 grades – XSE HV (Hybrid), Limited and Adventure grade – highlighting the RAV4’s ability to tackle the urban, suburban and great outdoors with ease. The fully-integrated campaign was developed under Total Toyota (T2), a cohesive marketing approach, inclusive of multicultural marketing, bringing together its agencies into a total market model called Total Toyota or T2. The Total Toyota team includes Saatchi & Saatchi, Burrell Communications, Conill Advertising and interTrend, with Zenith placing TV and outdoor media buys. Saatchi & Saatchi - “Missed It,” featuring indie folk band, Fleet Foxes, was directed by Markus Walter of Reset. The spot depicts a young couple at the airport in which the girl misses her flight in order to stay behind. They make a journey out of it in their RAV4. Burrell Communications – “Bring the Heat,” directed by Markus Walter of Reset, follows a group of foodie friends who are looking for the hottest restaurants in town, delving outside their comfort zone. 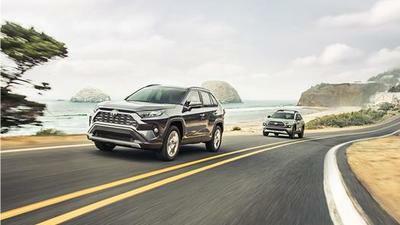 As they do, a classic soul track comically acts as the soundtrack to their misadventure to introduce the all-new RAV4. In “Fanatics,” which will go live in the Spring, a group of hoop fanatics fed up with their favorite team go on an epic search to find a winner and discover happiness in the unlikeliest of places thanks to the all-new RAV4 Hybrid. Conill Advertising – In “Late,” a group of friends arrive fashionably late to a party and take their all-new RAV4 on a detour to some fun adventures. In a second spot “Cousins” that will go live in the Spring, a simple proposition like, “What if you meet my family now?” becomes a multi-stop road trip across the country in the all-new RAV4. The spots were directed by Ida Cuéllar. interTrend - Directed by Manes Duerr is “Fort,” in which a hero takes on the challenge of building the ultimate doghouse with the help of the all-new RAV4 and “Hooked,” in which a tranquil fishing day turns into a thrilling experience thanks to the all-new RAV4. Toyota’s return to the 2019 Super Bowl kicked off the “What If?” campaign with a spotlight on two game-changers - the all-new RAV4 Hybrid and powerhouse female football player Antoinette “Toni” Harris. The spot, “Toni,” narrated by sportscaster Jim Nantz, features 22-year-old Detroit native Toni Harris, the first female collegiate football player to play a non-specialist position. Directed by legendary Super Bowl director Joe Pytka, who has directed more than 80 Super Bowl commercials, “Toni” was Pytka’s first time working with Toyota. Burrell Communications created and produced Toni’s story, with additional support from both Saatchi & Saatchi and Zenith Media. The “What If?” TV spots will air across high-profile prime and sports programming such as The Voice, Will & Grace, and the 2019 NBA Playoffs; interactive video units with NBC, Discovery & hulu; integrated media partnerships such as Twitter sponsorship – Billboard GRAMMYs® Pre-Show, Great Big Story, Tastemade, CNN Travel, Entertainment Weekly, People en Español and Telemundo’s “La Voz.” Digital content includes Uproxx, NCAA March Madness Live, Bleacher Report, ESPN.com, SI.com, YouTube, Snapchat and more. Additionally, spots will air within select movie titles in theaters nationwide in conjunction with National CineMedia. The “What If?” spots are available for viewing here. 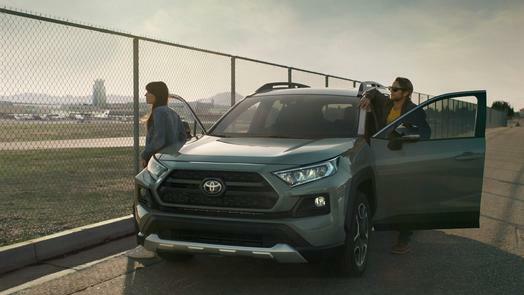 Click here to view the 2019 Toyota Super Bowl spot, “Toni.” All 2019 RAV4 gas models are on sale now in dealerships. 2019 RAV4 Hybrid models arrive in the Spring. For images and credits please click here. Toyota has been a part of the cultural fabric in the U.S. and North America for 60 years, and is committed to advancing sustainable, next-generation mobility through our Toyota and Lexus brands. During that time, Toyota has created a tremendous value chain as our teams have contributed to world-class design, engineering, and assembly of more than 36 million cars and trucks in North America, where we operate 14 manufacturing plants (10 in the U.S.) and directly employ more than 47,000 people (more than 37,000 in the U.S.). Our 1,800 North American dealerships (nearly 1,500 in the U.S.) sold more than 2.7 million cars and trucks (2.4 million in the U.S.) in 2018 – and about 87 percent of all Toyota vehicles sold over the past 15 years are still on the road today.